Striking modern design elements, an abundance of amenities and world-class fit and finish make the OA 90R different and unique. 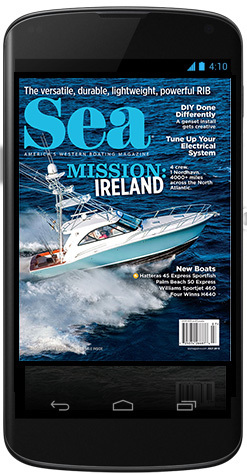 It does not seem that long ago that Ocean Alexander built midsized cruisers and trawlers in the 50-foot range. Many of those boats still ply the waters of the West Coast, a testimony to their reputation for being solidly built. Johnny Chueh runs the company that was founded by his father, Alex, and is responsible for driving the brand forward. His team grew the company from its modest beginnings into one of the premier motoryacht builders in the world. Today, Ocean Alexander (oceanalexander.com) models range from 70 feet up to 155 feet (except for a specialty boat, the 45 Divergence). Distinguished good looks run throughout the builder’s line, but the new Ocean Alexander 90 Revolution offers customers something different and unique. The Ocean Alexander 90R stands out in many ways, starting with an ultra-modern look developed by Evan K. Marshall in collaboration with the factory. A prominent plumb bow and high bulwarks are broken up by massive hull windows with blacked-out accents. A two-tone hardtop connects to a metallic gray arch that traverses both decks. On the swim platform, a transom beach club sparkles and dazzles invitingly. Its striking lines are bold and its presence formidable. For some owners that is part of the fun. The new and daring styling of the Ocean Alexander 90R is already proving to be popular. 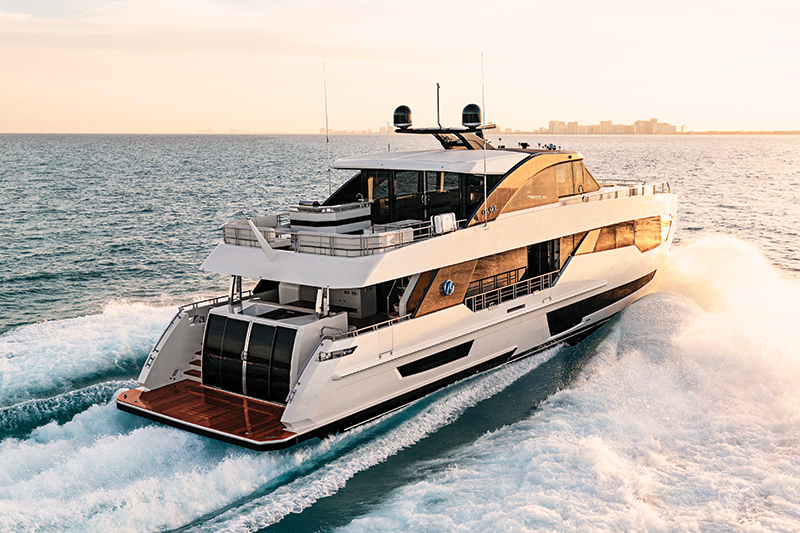 The first boat was sold off renderings, and subsequent boats have been purchased following the model’s debut at the Ft. Lauderdale International Boat Show last year. Distinctive styling is a theme that runs throughout the Ocean Alexander 90R, but with that style comes useful accommodation spaces and multiple gathering areas that can be connected or separated to suit the occasion. 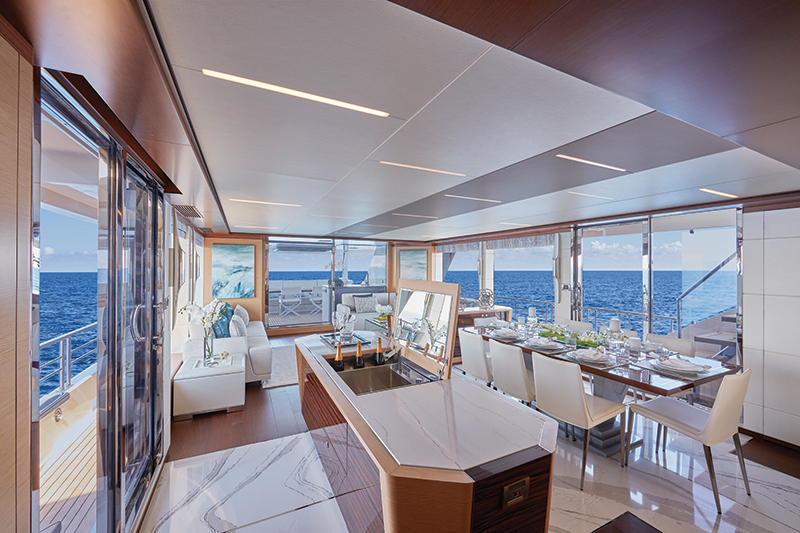 Aft deck seating surrounds a varnished teak table adjacent to sculpted stainless pillars with a recessed overhead that features direct and indirect lighting. Past a small wet bar, a stainless and glass sliding door provides salon access at the touch of a button; alternatively, a teak-covered stairwell leads up. The upper deck includes large seating areas both inside and out, a foldout TV, two bars and plenty of room to socialize. One bar is enclosed in the Skylounge and the other, outside on the aft deck, comes complete with a 24-inch custom “Electri-Chef” barbecue made of 316 stainless steel for better durability in the marine environment. The Skylounge has climate-controlled areas, but owners can open it up and let the gentle breezes blow. 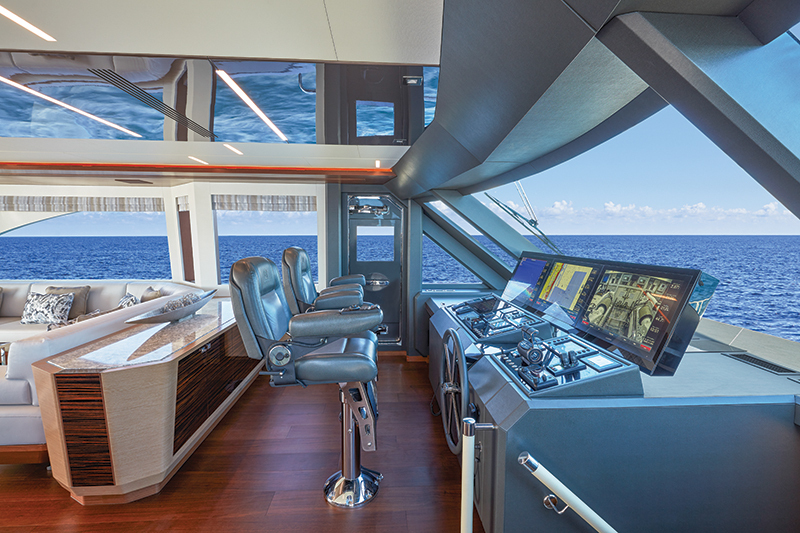 An alternate Open Bridge configuration shrinks the pilothouse and increases the open area. A Jacuzzi tub or a crane and davits for tender storage on deck are options. 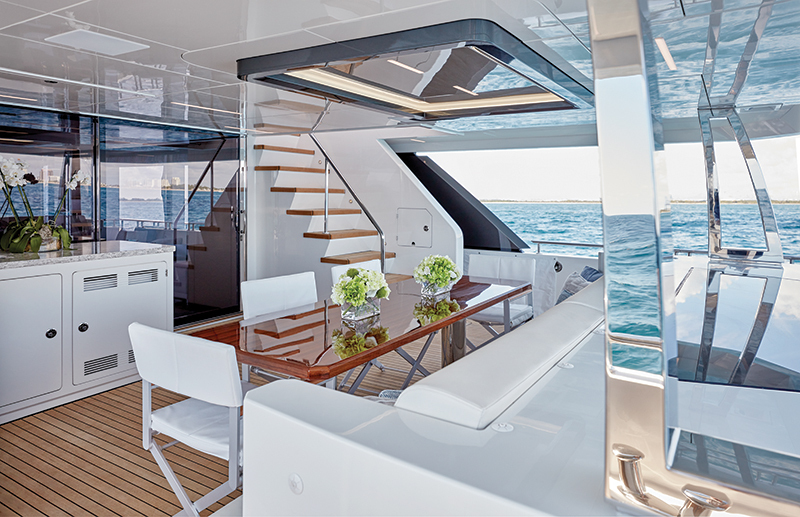 The open foredeck has a large forward-facing settee with a teak cocktail table and popup lighting. Opposite this is a massive sunpad that can be used for overflow seating. With its unobstructed view forward, this elevated perch will be a popular place to congregate. Whether for entertaining or as a spot away from the action, this area is ideal for sitting in the breeze or sun — an awning can cover the area — to read, converse or relax. A few steps down in a separate bow deck, twin Maxwell windlasses connect to anchors in pockets. This bow deck, completely protected by bulwarks, provides dramatic views forward and straight down to the water for folks standing “Titanic” style at the forepeak. A fold-down seat at the aft end would be a nice addition. The Ocean Alexander 90R Skylounge is easily accessed from the bow through matching watertight doors. Twin Stidd helm seats, a low leather-clad wheel, triple 24-inch Garmin MFD 8600 series displays, an autopilot, a 25 kw radar and more are standard. All controls are well laid out and easily reachable while standing, and the helm seat has a convenient Garmin controller in the armrest. A large center windshield provides good visibility dead ahead, and thin forward mullions barely break the angled view across the bow. Corner mullions are substantial, with structure there for the hardtop and the adjacent watertight doors on either side. To aid keeping watch, triangular corner windows and small windows in the doors provide increased visibility, but to starboard in the danger zone, care should be taken. A wired controller on a 20-foot cord can be plugged in on the sidedeck here or aft for better visibility while docking. 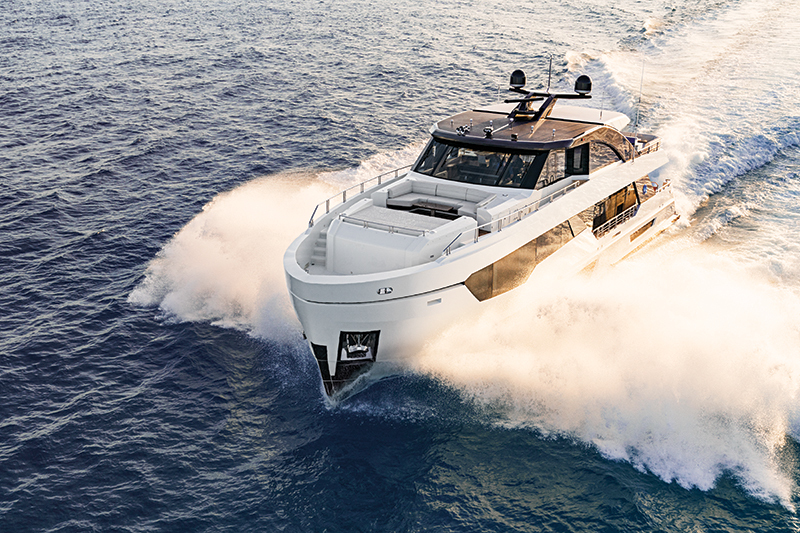 Ocean Alexander testing with optional MTU 16V2000 (2,600 hp) diesels yielded a top speed of 27.2 knots, a speed that makes the 90R the fastest of OA’s larger yachts. At a fast cruise of 22.1 knots, builder testing recorded a fuel burn of 204 gph, 0.11 nmpg, for a range of 292 miles. At a displacement speed of 11 knots, fuel burn during builder testing was 42 gph, or 0.26 nmpg. That yields a range of 714 miles, which demonstrates the versatility and range of the Ocean Alexander 90R and its abilities as a cruiser. An internal floating stairway near the helm connects the Skylounge to the salon, and a day head is conveniently located on the main deck just below the stairs. The full-beam main-deck master stateroom gives owners the kind of space, accommodation and privacy usually reserved for owners of much larger vessels. 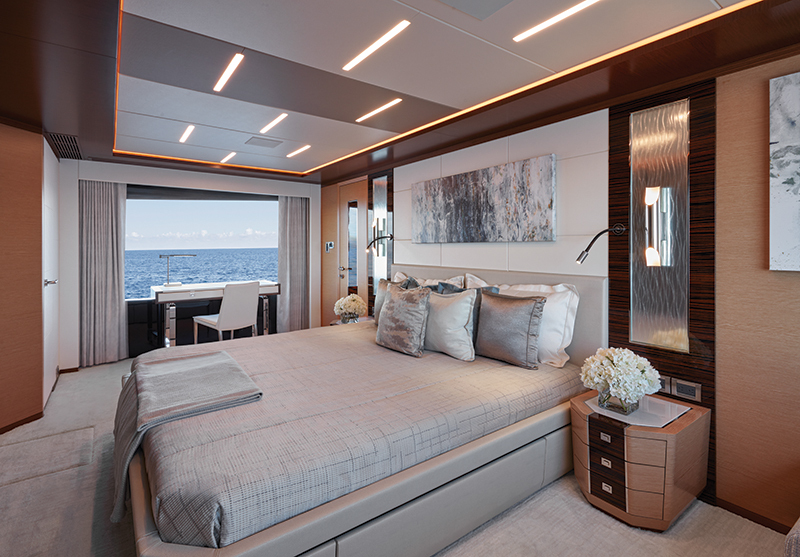 Belowdecks, all guest cabins have an en suite head and can be configured in multiple ways, including a second master that provides an additional full-beam master cabin below in addition to the on-deck master. Massive hull windows serve dual purposes. They provide stylish black-out patterns on the external surfaces of the hull and provide light and ambiance in the cabins below. Because of the windows’ proximity to the sea, Ocean Alexander takes extra steps to ensure their durability. Hull windows are made of the same high-tech glass used on high-speed trains, which is then framed in metal before being bonded to the hull. This glass is designed to withstand the flexing and tremendous air pressure created when trains pass each other in enclosed tunnels with closing speeds of more than 370 mph. It also has the high impact resistance necessary to protect against breaking. On the main deck, the salon — more than 320 square feet of living space between the aft door and the galley — is open and inviting. There are three distinct congregating areas, and enormous side windows and double sliding doors on each side provide access to the sidedecks and twin stairways that lead forward. A long fore and aft counter to starboard contains a sink and a beverage serving center with storage space for wine, champagne and beer. 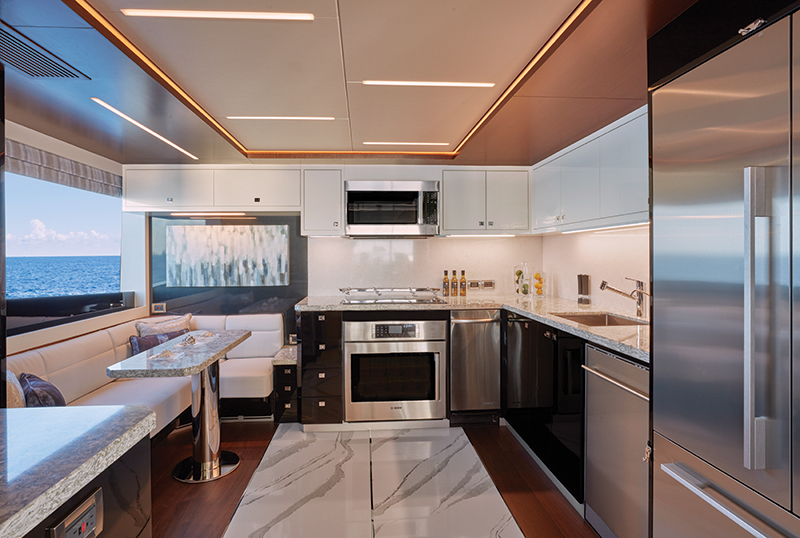 To port is a dining table for eight and a fully appointed galley with all stainless appliances, its own breakfast nook and twin sliding doors. It has the same modern elegance as the salon. 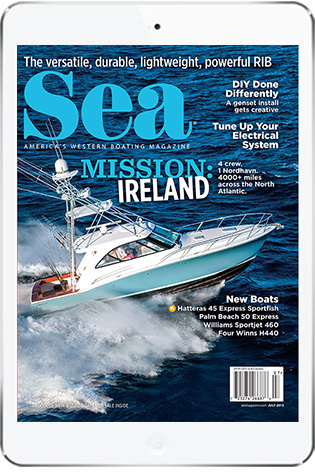 This setup provides owners of the Ocean Alexander 90R some flexibility. The galley doors can be left open for casual gatherings, or they can be closed for a more formal dining experience or to separate the food prep area from the guests during a night of entertaining. Free-standing dining chairs can be moved to create more open space for large parties. The table and the long buffet/bar provide vast serving space. 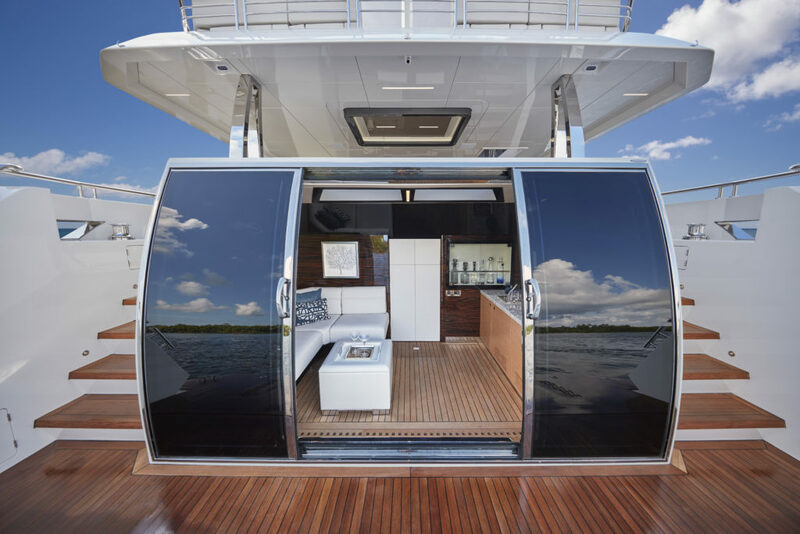 During fair weather the side doors can be opened on both sides for cross ventilation and deck access. This area is well suited for fine dining or for guests enjoying appetizers and cocktails as they mingle in and out of the salon. The interior is elegantly finished with a mix of stone, walnut floors that OA custom makes, two-tone cabinets of ebony and oak, stainless accents and contemporary lighting. 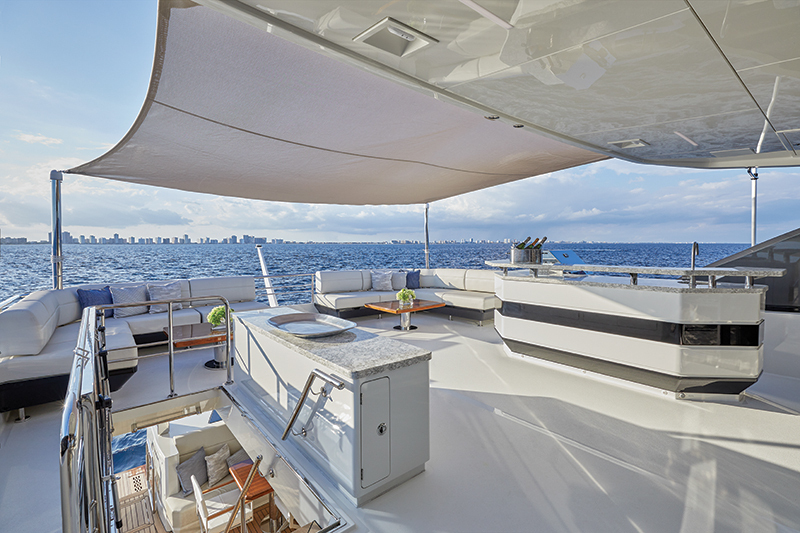 Comfortable seating aft connects easily to the dining/serving areas and the aft deck, and features a drop-down TV. A beach club adjacent to the water is accessed by twin glass doors in the transom. Teak continues from the swim platform into the beach club for continuity. Realizing that the integrity of these doors while underway is important, Ocean Alexander specially designed them to withstand Sea State 5 (13-foot waves) and isolated the area with a watertight bulkhead for added security. The beach club features a wet bar, seating, varnished wood accents, cloth wall panels and a hidden watertight access door into the crew quarters. Fully finished to yacht quality, the crew quarters include a head with a separate shower, three crew beds in two cabins and a crew mess with a TV. Through these quarters is access to the engine room, which is well laid out and has 6 feet, 8 inches of headroom, a stainless diamond-plate sole, heavy-duty grabrails, and well-labeled pumps and manifolds. An internal stairway leads up from the crew/aft area to the portside deck, and twin stairwells lead from the beach club up to the aft deck. The Ocean Alexander 90R combines eye-catching contemporary styling, a versatile layout, and a variety of quality features. 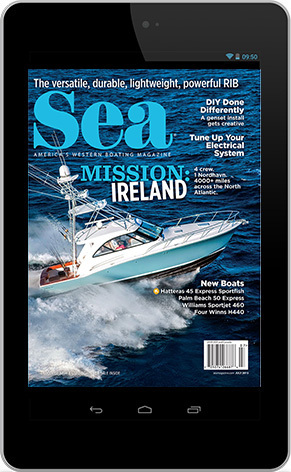 Accommodations, social spaces, and serving and gathering areas rival those found on much larger yachts. The open layout is ideal for entertaining and eight plus crew can comfortably sleep aboard. LOA 90 ft., 1 in. Beam 22 ft., 5 in. This entry was posted in Snapshot, New Boats and tagged Ocean Alexander, new yacht, ocean alexander 90r, beach club, modern yacht design by Mike Werling. Bookmark the permalink.